Global vision systems as found in the small size league are prohibited in the middle size league. 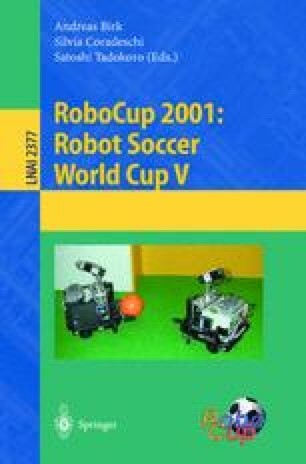 This paper presents methods for creating a global view of the world by cooperative sensing of a team of robots. We develop a multi-object tracking algorithm based on Kalman filtering and a single-object tracking method involving a combination of Kalman filtering and Markov localization for outlier detection. We apply these methods for robots participating in the middle-size league and compare them to a simple averaging method. Results including situations from real competition games are presented. This work has been partially supported by Deutsche Forschungsgemeinschaft (DFG), by Medien- und Filmgesellschaft Baden- Württemberg mbH (MFG), and by SICK AG. New address: Sony Corporation, Digital Creatures Laboratory, Tokyo 141-0001, Japan.